For the budding scientist or researcher, the right microscope isn’t a flimsy plastic toy that at best gives you warped, blurrily magnified images of your specimens through their plastic lenses. A properly functioning microscope, though not as inexpensive as many plastic and ‘toy’ options, can last years and prove a brilliant supplement to your child’s curiosity in exploring their world and the scientific phenomena it’s made up of. Of course, the type of microscope you ought to be looking for will differ depending on what it’s going to be used for – if it’s a microscope being used to examine leaves, insects or coins, a stereo microscope is better suited for the larger specimens. On the other hand, if the microscope is going to be used in school or to study more complex and miniscule specimens – for instance, the cells on a sliver of onion skin or a blood sample – you’re going to need a compound microscope for the appropriate magnification. Overwhelmed? We’ve shortlisted our picks for the best microscope for kids that aren’t just toy scopes with short lifespans. This microscope means business – despite being an entry-level scope, it’s engineered to encourage and assist your research and educational pursuits. A monocular unit, the single eyepiece viewing head is better suited for the closer set eyes of children compared to binocular models which would be too difficult and inefficient for children to use. With a durable metal frame and six levels of magnification ranging from 120x to 1,200x, the kit comes with plenty of items to equip you for practising and fine-tuning microscope applications, including tools like a spatula, scalpel and tweezers. In fact, as a beginner’s set, the kit contains not only 7 unused specimen slides, but also 5 prepared slides to give you a kickstart in examining specimens and feed your child’s curiosity, as well as gum media to secure your lenses and everything you’ll need to hatch brine shrimp including a hatchery, eggs, petri dish and so on. Moving on to the more technical features, the microscope comes with a standard stage, with both in-built white LED lights as well as reflective mirrors so you can use natural light for illumination. A rotating color filter wheel also allows you to color-correct as you hone in on your specimen, the coaxial coarse focus knob letting you move the objective lens toward or away from the specimen to adjust the focus. Achromatic lenses offer up to 60% of the central field of view free of aberrations, the whole kit packed into a hardy ABS plastic case and running on 2 AA batteries. An educationally geared microscope for young beginners, this pocket-friendly microscope may be described as a ‘toy’ but is nonetheless still a serious contender for this list. A monocular model more child-friendly than binocular eyepieces, the unit features magnification levels of 100x, 400x and 1,200x and LED illumination to avoid inaccurate coloring as you view your specimens. As a budget unit, it’s understandable that this kit doesn’t come with samples to start you off, but it does come with two collection bottles and glass slides to encourage and enable you to collect your own specimens, as well as a plastic container, blank labels and forceps. 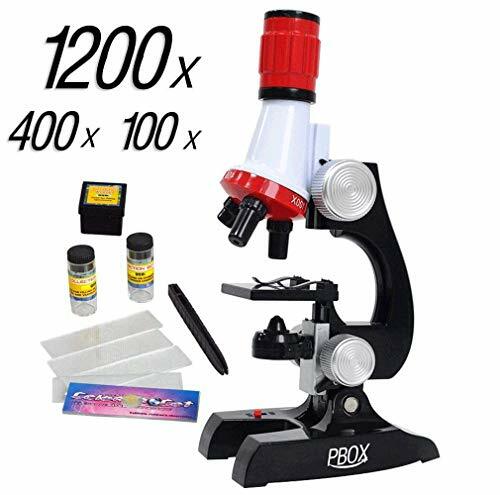 A compound microscope with three available magnification levels of 40x, 100x and 400x, this is the perfect heavy-duty scope for children of ages 8 and up. The set comes with a kit ready to kickstart your curiosity and exploration of your environment at a young age, featuring a set of already prepared specimens on authentic glass slides and stains for you to examine, as well as unused slides for your own experiments and research. Other tools include forceps, dropper, test tube, petri dish and more, setting up a mini-laboratory to feed your interest and facilitate it. A handy guide is available thanks to the World of the Microscope Book included with the kit, to equip you with the knowledge you need to make the most of your microscope. Coarse focus controls let you move the objective lenses closer and further away from the specimen to focus the image you’re receiving, the monocular head type making it perfect for children to use comfortably. 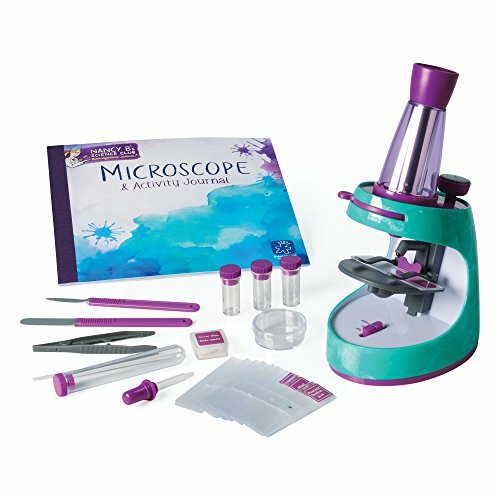 An award-winning microscope set for kids, the achromatic lenses of the scope ensure a very crisp and clear field of view in the central 60%, the standard for most high-functioning and durable personal microscopes. Thanks to LED illumination, you get crisp, clear focus from a moderately heatless source which doesn’t alter the color accuracy of your specimen. Another award winning entry on this list designed specifically with the needs of children in mind, this compound microscope offers magnification of three levels – 30x, 100x and 400x. 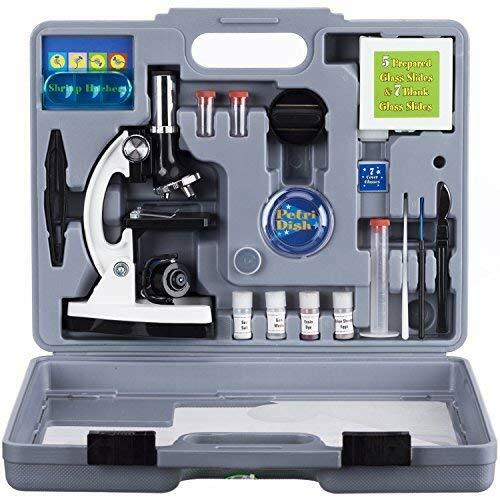 Along with 4 prepared slides, the kit comes with 7 blank slides, petri dish, tweezers, spatula, scalpel, stirring rod, test tube and more to set up the budding researcher or scientist, equipping your child with the tools to explore the technicalities of anything from leaves and flowers to the complex textures making up a patch of dead skin. 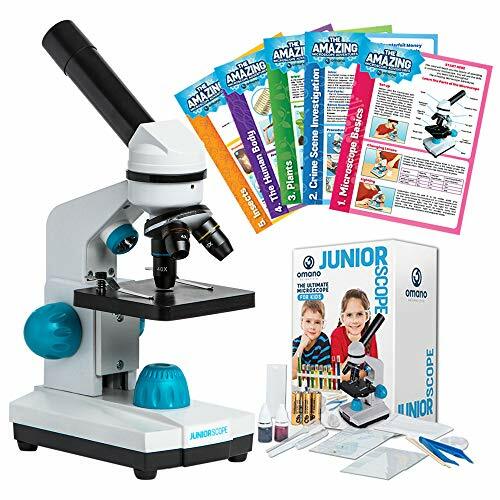 Kids are encouraged to learn through hands-on experience with the Activity Journal included with the kit, featuring easy and child-friendly experiments and other activities to engross your child. An intuitive focus knob lets you sharpen and adjust the image you’re viewing through the monocular eyepiece, suitable for kids, the metallic structure not detracting from the pleasant color scheme of the microscope, more attractive than the clinical and perhaps intimidating look of most professionally used or lab-based microscopes. LED illumination ensures sharp and clear focus without generating heat, burning too much energy or interfering with the color accuracy of the specimen image you view through the eyepiece, running on 3 AAA batteries.